Once upon a time, Sophie Taylor had a restaurant in Manhattan. Unfortunately, like so many other restaurants every year, hers did not have a happy ending. The failure stings, but she knows what her next move will be. She’ll return to Gracious Grove, the lovely small town in New York that was the site of all her best summer memories. 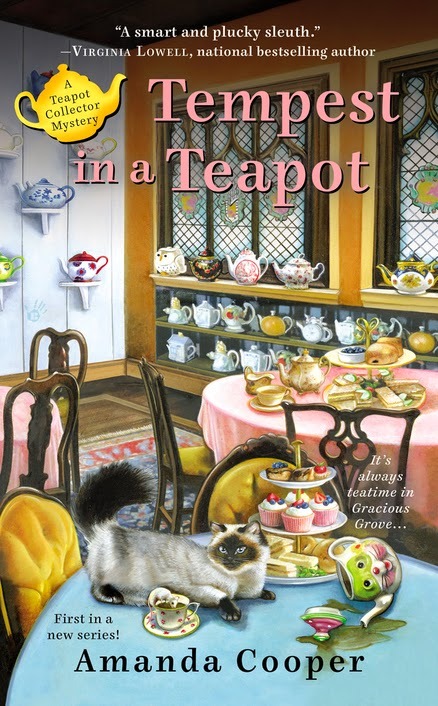 Her grandmother is there, running Auntie Rose’s Victorian Teahouse, just as she has done for the past forty years, with great success. In fact, the town boasts two tearooms. The second, located just next door, is The Belle Epoch. It was once an inn as well, but as she’s aged, owner Thelma Mae Earnshaw has mostly stopped renting to guests, concentrating on her tearoom, with mixed success. Thelma Mae and Rose share a history that goes back over sixty years; a friendship fractured when a boy chose Rose over Thelma. Thelma never really got over it. When Sophie arrives, she finds, like most adults, that much has changed and much has stayed the same. Her best friend, Cissy, is engaged to Francis Whittaker, son and heir to the wealthy doyenne Vivienne Whittaker. Their engagement party is taking place at The Belle Epoch (Thelma Mae is Cissy’s grandmother) and attended by the highest of Gracious Grove society. But the party is interrupted by a scream. Sophie races over to help, only to discover Vivienne, on the floor, clearly in her death throes. The cause of death is quickly established: poison. Someone at the tea party must be a murderer. Sophie is an interesting character; she’s someone who tried for her big dream and failed, but is more than willing to get back up and try something else. True, she’s lucky to have her Nana and the tearoom to fall back on, but it’s clear that her grandmother is equally happy to have her there. The two women (and assistant, Laverne) relate to each other as only real friends can. The reader meets the various residents through Sophie’s adult eyes, comparing them to her memories. It makes sense that Sophie would want to help her friend, Cissy, who is trying to console her fiancé after the death of his mother. And Sophie manages to do a lot of nosing around without looking too suspicious by using social gatherings and casual run-ins to ask questions. The story is told in third person, and it involves some changes in point-of-view. This device can be confusing, but here, it’s used to great effect. There’s no better way to know what Thelma Mae is really thinking, for instance, than to switch pov and listen in on her thoughts. This device fills in a lot of gaps, and also creates great depth in what might otherwise come across as a ‘cranky old lady’ stock character. The plot here is has layers that sometimes go missing in cozy mysteries. And it contains a scene that may have whiskers, but is one of my favorites: the scene that gathers together all the suspects to get at the truth. (Blame Nero Wolfe, Hercule Poirot, et al, for my love of those scenes.) Full of interesting, realistic characters, this is a very strong start to a new series.